Have you ever seen a cat’s eyes at night? They look like mirrors shining back at you. Well, humans don’t have a tapetum in their eyes that cause this light reflection allowing enhanced vision in the dark. But, we do have technology! Both night vision (NV) and thermal imaging devices allow you to see what’s creepin’ and crawlin’ when the sun goes down. If you’re dealing with a wild hog or pest problem, practicing tactical scenarios, or simply want to know who or what’s stalking your campground at night, either one of these devices might be for you. Here, we will compare night vision vs thermal and get into what NV devices can offer and how thermal imaging has recently entered the field as a viable competitor. Let us help you to see the light! “Gathering” light is a term that even we’re guilty of throwing around, but it’s a bunch of crock. No scope can “gather” light as it can only transmit ambient or available light. With that said, there are some scopes better than others at transmitting light, and it’s dependent on optical quality such as glass and coatings. However, electricity can provide a significant boost in a scope’s ability to transmit what little light is available like star and moon light. This is why NV scopes and monoculars are sometimes known as Starlight Scopes, and they’re able to provide an image 20,000-50,000 times brighter than what you’d see with the naked eye. They’ve been around for a long time, think WWII. Since then, technology has improved a great deal, and we now have NV scopes capable of so much more that they’re not available for export outside of the United States. On that note, NV scopes are just like typical rifle scopes when optics matter, but they also have a power source to produce a green or black and white image to allow image intensification to see in the dark. The process is extremely interesting, and we’ll do our best to simplify it. For the cut-to-the-chase explanation, NV scopes take minimal, available light and turns it into electricity. It’s then intensified to be converted back into light to be viewed as an image. Did that confuse you even more? Let us help out with that. The tube body in a NV scope is what’s known as the image intensifier tube and is a vacuum tube. What happens is, light that comes through the objective lens at this stage are photons. It travels down the tube first passing through the photo cathode that converts the photons to electrons. The electrons pass through and multiply by the thousands through the microchannel plate. The microchannel plate contains millions of microscopic channels or glass tubes. These tubes have to be uniform in spacing and density to produce sharp resolution in the resulting image. The electrons then pass through a phosphor screen where they’re converted back into light to produce an image to the viewer. The manufacturing process is extremely complex and can easily require over 400 steps before you have a finished product. Variations in types of glass used, additional ion coatings, and the use of a microchannel plate is dependent on the type of Generation technology your NV device has. For having been around since the ’40s, you can imagine there’s been a great deal of improvement from the very first NV devices. Today, we have what you call NV Generations to differentiate between the advancements in NV technologies. As you would expect, there are differing grades or levels within the most advanced tech, Gen 3 that includes autogated tubes and filmless or unfilmed technology. There will also be differing levels of quality of scopes between manufacturers. Thermal imaging is the ability to see parts of the light spectrum that we can’t see with the naked eye. Light is simply radiation. The radiation or rays of the electro-magnetic spectrum have varying lengths and we interpret this as color. Short wavelengths have the highest amount of energy, and longer wavelengths have the least amount of energy. The human eye is capable of only seeing a small portion of this spectrum with lengths of about 400 and 800 nanometers. In relation to thermal imaging, a part of the spectrum unperceivable to the human eye is the infrared (IR) spectrum. Being able to see this part of the spectrum with technology allows us to see radiation emitted from objects, people, and animals in the day or dark. This tells us that thermal imaging devices are “active” since they don’t require any ambient or artificial light to operate. Through a thermal imaging monocular or scope, we see an image that offers cool colors like varying shades of blue to determine objects. Images emitting varying shades of red shows heat from a living object like a person or an animal. Being able to see this in pitch black or in obscure terrain like brush and thick timber can be a great asset in the field. Does Thermal Imaging Resolution Matter? Yes, it does! Since optics aren’t the major player here, like how we depend on glass and coatings for non-IR scopes, you should know about how resolution formats affect your thermal imaging buy. A 240 x 180 format will get the job done. Going up to a 320 x 240 format is even better. However, the best format for handheld optics will be the 640 x 480 format. Newer products now sport even more sharpness and detail with formats of 640 x 512. As you look for a scope with higher resolution, expect to pay a lot more. Scope focuses IR energy on target area/scene. Detector elements rapidly obtain temperature data within the field of view. Thermogram is converted to electronic impulses. Electronic impulses are sent to signal-processing unit that contains a chip and circuit board. Signal-processing unit sends this collected data to the display. The display appears with varying colors dependent on the intensity of the infrared emission from the objects in the field of view of the target scene. So, you have your optics objective lens, the IR detector elements, signal-processing unit, and then finally your eyepiece/display. There’s a lot going on between the two lenses, but what you end up with is a bright view in the pitch of darkness. There’s two types of common thermal imaging systems, un-cooled thermal imaging and cryogenically cooled thermal imaging. However, the un-cooled system is going to be the standard system used in rifle scopes. Cryogenically cooled thermal imaging is a very high-tech technology that’s typically saved for cameras since they offer extremely fine details that can be very expensive. This is the most-common system used in most thermal imaging devices. The key components in this scope operates at room temperature. Due to this design, no extra equipment is necessary to cool off the elements within the tube for functionality and performance. This makes for a quiet and covert device for hunting. Additionally, the power source is built-in. Very expensive technology that involves keeping the sealed internal components in a specialized container to maintain temperatures below 32 degrees Fahrenheit (F). The benefits are significant improvement in resolution and increased sensitivity for detection of temperature differences of just 0.2 degrees F.
IR illuminators are like flashlights that focus IR energy on the target area/scene. The IR energy isn’t visible to the human eye. Many rifle scopes have built-in IR illuminators that are good for up to about 30 yards. It aids passive Gen 1 scopes in providing a brighter image. But, there are some high-tech Gen 3 scopes that do need help with an IR illuminator for situations like in dark buildings or in dark areas like heavy timber and shaded spots. Medium to long range illuminators can also provide distance ranges of up to 500 yards. While Gen 1 scopes with IR illuminators have a built-in one, they’re always on and you are unable to shut it off. Gen 2 and up scopes that have an illuminator should come with an on/off switch. 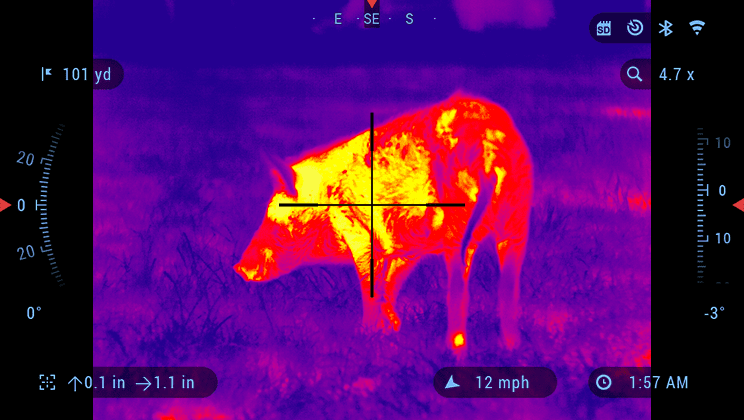 Which is Best For You: Night Vision or Thermal Imaging? Both NV and thermal imaging devices are considered night vision devices in and of themselves. They just have different ways in which they work. NV devices are considered “passive” since they require minimal light to work. Thermal scopes are considered “active” devices since they focus infrared light on the target area and don’t need light to operate. It’s time to put these two NV scopes against each other and see who holds up better than the other! It might be obvious that a NV and thermal scope would be used exclusively for nighttime use. However, there may be some situations where you want positive identification on your target despite lighting conditions. Most NV scopes are only compatible with night use as bright light conditions can be destructive to internal components, but that’s not the rule. There are some high-end NV scopes that can now function in day time use as well. But, thermal has the upper hand in that they’re more compatible for dual use because they don’t depend on light to operate. NV takes this one. While it is dependent on ambient light to produce an image, a detailed image can still be produced to viably recognize and identify game. Thermal imaging is excellent for detecting game, but it’s unable to provide positive identification like facial features the way NV can. In this case, it’s of more import to buy a high-end NV scope that provides excellent resolution and image quality over a low-end thermal imaging scope that might only provide blobs of color. Both types of rifle scopes can be very durable and reliable optics. Both scopes have vital components that need to be protected, and they can withstand .30 caliber recoils. NV has been around for decades, and because of its longevity, it’s become available to civilians for a lot longer than thermal imaging and consequently has become more affordable. Thermal imaging is a new technology recently made available to civilians after the military released the tech to car manufacturers. So, it’s become more affordable, but they’re still extremely expensive products. As mentioned before, you can land a high-end Gen 3 scope for the price of a low-end thermal imaging scope. Night Vision vs Thermal: Luxury At Its Best! There’s no doubt that both NV and thermal imaging scopes are luxury tools in the hunt. However, they may be luxurious optics but they’re essential tools for wild hog hunting, controlling nocturnal varmint and pest infestations, and even for some tactical and personal security purposes. If you’re serious about your needs for either one of these scopes, it’s going to cost you a luxurious amount of bucks. But, if you’ve got the best, you’re more likely to get results! Check out our line-up of the best Night Vision Scopes!